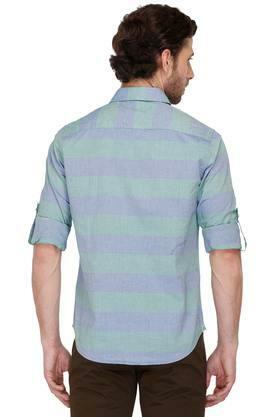 Let your wardrobe choices reflect your personality as you add this shirt from United Colors of Benetton to your closet. Tailored with care using fine quality fabric, it promises to sheer comfort and a luxury feel. Besides, it comes with a stripe pattern, thus making it all the more fashionable. A mix of simple style and utmost comfort, this shirt will be a great choice for casual occasions. You can wear it with a pair of jeans and loafers to put your best foot forward.